Lung cancer is the number one cause of cancer deaths in the U.S. for both men and women. Part of the reason is that lung cancer often has no symptoms until it’s already at an advanced stage. Lung cancer screening aims to find the disease at an earlier stage, when treatment is more effective. 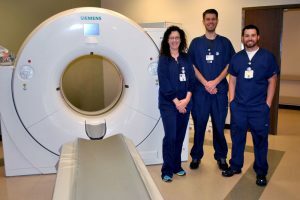 The only proven test for this purpose is low-dose computed tomography (LDCT), which is available at LeConte Medical Center (pictured above). In LDCT, a specific type of X-ray machine scans your body and uses a low dose of radiation to create high-quality images of your lungs. Research has shown that LDCT can reduce the risk of dying of lung cancer in heavy smokers. Screening may detect lung abnormalities that turn out not to be cancer, but that prompt additional testing or procedures. To help ensure that the benefits outweigh the risks, yearly lung cancer screening is typically reserved for people ages 55 to 80 with a history of heavy smoking. If your doctor recommends lung cancer screening, discuss the pros and cons for you. Here’s a quick look at what the test entails. Metal can affect the image on LDCT scans. Before your scan, you’ll be asked to remove metal objects, such as jewelry, hairpins, eyeglasses, and removable dental work. LDCT is a painless, noninvasive imaging test. In the test, an X-ray machine scans your body in a spiral path. This machine is linked to a computer, which processes the scanned information and creates a series of detailed images. The amount of radiation to which you’re exposed is up to 90% less than with a conventional CT scan of the chest. The machine used for LDCT typically looks like a large box with a short tunnel in the middle. You’ll lie on a table that slides in and out of this tunnel. A technologist will help you get into the right position on the table—usually lying flat on your back. Once you’re in position, the table slides through the tunnel quickly to find a starting point for the scan. Then the table slides through a second time as the scan is performed. During this scanning process, any motion—even breathing—could blur the image. You’ll need to hold your breath for five to 10 seconds. About one in four LDCT screenings find abnormal areas in or near the lungs. Most turn out to be something other than cancer, such as scarring from a past infection. To know for sure, however, you’ll likely need follow-up testing. Often, you’ll be asked to come back for another LDCT scan in several months. By comparing the two scans, your doctor can see whether the abnormal area is growing. If it is, your doctor may recommend further evaluation. You might need to get another type of imaging study or a biopsy (removal of tissue for analysis in the lab). At every step along the way, your doctor should clearly explain the process. If you have any questions about getting screened or understanding the results, don’t hesitate to ask.